Robots are awesome. They're fearless. They are precise. They can perform the same task over and over without getting bored. More importantly, no matter how bad you treat them, they won't go on strike or sue you for that matter. 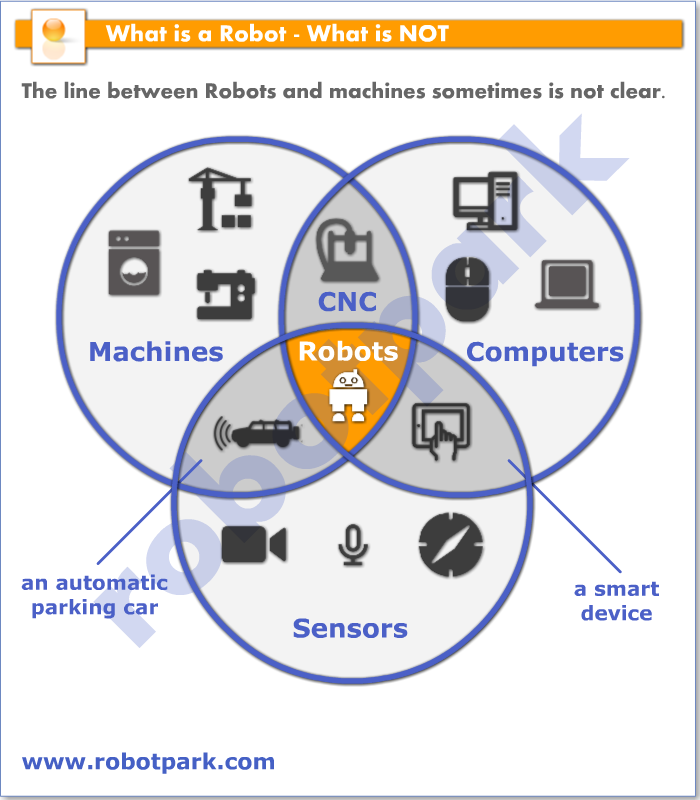 Here on this page, we will try to understand one simple question: "What is a robot?" As far as the exact definition of a robot is concerned, you’d be hard pressed to find one that is widely accepted. You see, not every machine that you come across could be called a Robot. My iPhone, albeit it’s amazing, is in no way a robot. The same could be said about the Laptops, Vacuum cleaners, Washing machines, you name it. For a machine to fall in the category of robots,and to be the answer of "What is a Robot?" question, it should have following features in its repertoire. Robots should be able to sense to interact with their environment, Robots use different kinds of sensors. These could be light sensors, temperature sensors, pressure sensors, proximity sensors, and distance sensors. The last thing you want for a robot is to repeatedly crash into the furniture.The sensors of a robot are the main units that avoid it crashing the furniture in that sense. Robots are supposed to show some kind of intelligence, like solving complex problems, having social interactions or the ability to learn virtually anything. They accomplish all of this through Artificial Intelligence. Artificial intelligence allows a robot to assess its status and generate a plan according to this assessment to act. If your machine lacks significant AI, it probably isn’t a robot. For a robot to interact with its environment, they should act besides sensing. Acting has a wide meaning when it is for robots and it can be seen in different forms. Acting is not just moving around for a robot. For a robot acting is the ability to manipulate its environment in any way. Acting is not just a robot's changing its position or manipulation of an object, it is also changing the temperature or humidity of a room. 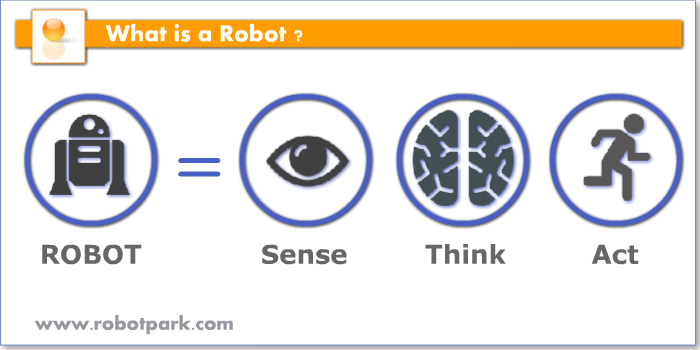 There is no one simple definition of what is a robot. There are lots of different kinds of machines, some of them is called a robot, some of them not. Joseph Engelberger, once remarked: "I can't define a robot, but I know one when I see one." -a Cnc Machine is very occasionally called as a robot, but an industrial arm is always characterized as a robot. -A Zoomorphic mechanical toy (Lynxmotion T-Hex) , is usually named as a robot. -An Autonomous Wheeled or Tracked thing, such as (Dagu Rower 5) , is nearly always named as a robot. 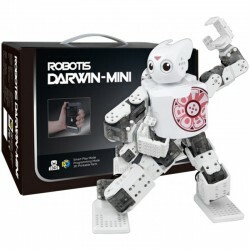 -A Humanoid, like (Robotis Darwin), is nearly always named as a robot. 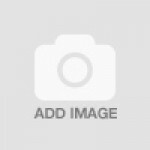 -A Computer Controller Car, like Google Car, can be named as a robot as it can sense,think and act. On the other hand, only being anthropomorphic is not enough for something to be called a robot. A robot has to Sense,Think and Act. A human body shaped mechanical object would not be a robot. So we can say the physical appearance of a machine is not enough to name it as a robot. After the definition “robot”, the next term should be “robotics”. 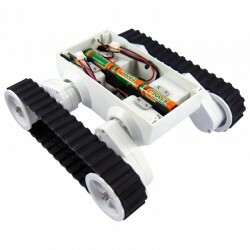 Robotics is the science and study of designing, building and utilizing robots. So, if you’re planning to build an automata from scratch or you’re using a ready-made robot, you’re essentially working in the field of robotics. And these are exciting times to be in this field where lots of intriguing discoveries are being made and tons of new information is being contributed to human knowledge. The word Robotics, used to describe this field of study, was coined by the science fiction writer Isaac Asimov. He defined the "Three Laws of Robotics" which is mentioned in a movie called iRobot.